Shri NPV Ramasamy Udayar was born on September 19, 1936, in a small town in the current Namakkal district of Tamil Nadu called Rasipuram. His meteoric rise as an industrialist was propelled by an astute business sense but even more important an untiring spirit and hard work. In the early eighties Mr. Udayar was a highly successful industrialist, respected by his colleagues, and admired even by his competitors. He felt that there was an unfulfilled aspiration in his heart; a desire to create something that will be a lasting benefit to the community; this desire kept burning like a fire in his heart. The dream took form with the help of the then Chief Minister of Tamil Nadu - Bharat Ratna Dr. M.G. Ramachandran. Out of this partnership birthed the plans for the first privately owned medical college in Tamil Nadu. On September 11th 1985, Sri Ramachandra Medical College was started in a two storey building in Vembuliamman Street in Valasaravakkam. The first outpatient clinic in a make shift shed. The next few years saw the true grit of the man- his blood sweat and toil saw the creation of a world class campus out of a 150 acres of farmland near the Porur lake. 1994 was a landmark year for SRMC. The college became a deemed to be university - a world class tertiary care medical centre took root. Seeds for specialties were sown. In this substrate of hard work grew institutions committed to advancing the best in the health care sciences - in dentistry and nursing and physiotherapy. It was not just growth but growth with innovation as epitomized by the allied health science program and growth with vision as epitomized by the programs in genetics and biotechnology and informatics. Throughout its short history SRMC has made its own path, creating unique ground breaking programs in the health care sciences. But this is only one of the many dimensions of this organisation. SRMC went to the best medical school in the world to acquire its partner in excellence. 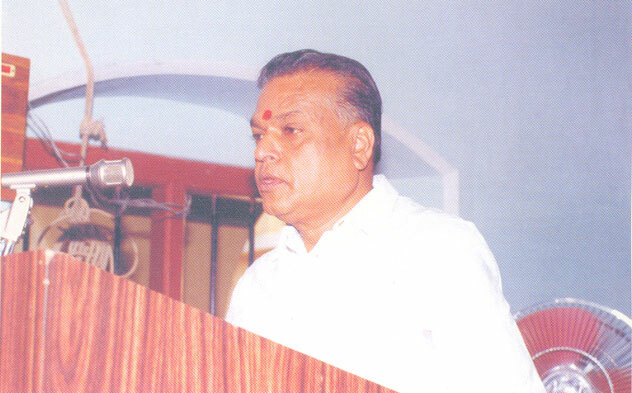 In July 1997, Shri N.P.V. Ramasamy Udayar shook hands with Robert Crone CEO of Harvard Medical International, sealing a partnership that has grown in strength over time. Starting with student exchange the alliance has spearheaded curriculum reform, focused on health care quality, safety, leadership and faculty development. A journey is measured by the friends we make - SRMC has made many friends and partners around the world during its journey. The torch was passed in 1998. The journey did not end - it continued through steps some times and leaps at others. SRMC is now one of the largest private health care infrastructures in India. Today, SRMC has over 750 faculties and three thousand students; it touches the lives of over 3500 patients each day; through its telemedicine network it reaches over 10 centres in the country; through its international wing SRHI, its reaching out to the global village; it is in the forefront of cutting edge technology - with a wireless campus, computer assisted learning, and keyhole surgery. SRMC looks to the future today - with inspiration from its past; and the strength of its present guided by the vision and blessing of its founder and driven by a passion for excellence. It is with a great sense of pleasure and joy that I welcome you to this campus as a student. Our Trust when it was conceived in the year 1985, dedicated this institution to the proposition that it shall reach the heights of excellence in the fields of medical and health related education, research and patient care. Since then we have worked with a great sense of determination and commitment to make this 150 green acres develop as a mini town with all the facilities inside, keeping in mind the ecology of the surroundings. We are aware that this is going to be your home away from your own home for the next several years and it is vital that the campus is healthy for your growth and comfort. I myself have spared no pains to procure everything that is considered essential to accomplish this. Your parents do expect us to provide appropriate facilities for your development during the next several crucial years in your life. Myself and the administrators of this institution will be happy to listen to your suggestions, requests, and complaints and take such actions as necessary to improve the situation. But it is very essential that you keep the communication line open and have no hesitation in approaching us. It is also possible that some of you may have unusual, personal, social and adjustment problems particularly when you are away from your own families for a long time. My faculty, staff, wardens and the Dean of Faculties assure me that they will provide such counselling services as may be necessary in the individual circumstances. Such services will be given entirely on a one on one basis in strict confidentiality. But again it is up to you to seek such help from us when you are in need. Although you are here primarily in pursuit of good education and qualification, we believe that you should have adequate opportunities for extra curricular activities particularly cultural and sports. We encourage all such activities that will help you develop an all round personality and become an excellent professional. At this juncture it is important that you become aware of our expectation of you. As much as you have a right to stay and enjoy the privileges in the campus every other student who is here has the right as well. This institution cannot tolerate any student intimidating other students in the form of teasing, ragging or cause any kind of harm to fellow student physically or emotionally. We do not have a place in this institution for such indiscipline and any student who indulges in such activities will be summarily expelled. Students and parents should also be aware of the recent strict laws that have been enforced by the State Government of Tamil Nadu against any form of ragging inside college campuses. We shall not be responsible for action taken by the Government against offending students. Any student victimized by any other student has no other choice except to report the incident immediately to the Dean of Faculties. It is expected of every student that he will abide by all the rules and regulations of the colleges and the hostel at all times.Students who have difficulties with the subject are encouraged to directly seek counseling from the Head of the Department concerned. He is further encouraged to contact the administration to obtain necessary help for improvement. As a policy it is demanded of every student that he/she maintains 80% attendance in every subject and also meet the standards required for internal assessment examinations. In the matter of allowing a candidate to appear for examinations, the final authority is the concerned Head of the Department and the Dean of Faculties.